Archbishop Viganó’s New Earth-Shattering Letter. God Bless Him! A month ago Archbishop Viganó exposed the secrets of the homosexual network in the Vatican and the Catholic Church. He called on Pope Francis to resign and all the bishops and Cardinals in the network to resign with him. Since Pope Francis has been silent (and unhappily Pope Emeritus Benedict too) Archbishop Viganó has released a new letter. If you haven’t read it yet you need to do so. God bless this Archbishop. Article and full text here. Matt Fradd explains why we can and should criticize a pope. 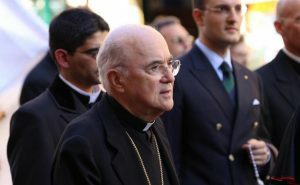 His commentary on ++Viganó’s letter. Great video here…. I would suggest that the one who is dividing the kingdom is the one who is against Jesus and there is a lot of those in the hierarchy today, the homosexuals, the abusers and the abuse protectors who fall into this category — all the way to the top. Thanks for sharing the verse. May God continue to protect this good and brave man. Vigano! Vigano! Vigano!